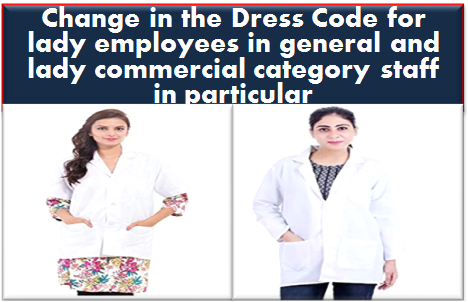 Sub: Change in the Dress Code for lady employees in general and lady commercial category staff in particular-reg. Several women employees have since represented to the Federation that the uniform presently prescribed for women Commercial Staff is not only mismatching with the duties being performed by them but also not suiting in the changed overall scenario world-wide. In this connection, copies of model uniforms for lady Commercial Staff since suggested are enclosed. NFIR is of the view that the suggestion of women Commercial Staff is valid and therefore necessity has arisen to review the present Dress Code for meeting with the genuine demand of female Commercial Staff. The female employees may also be given the choice to select uniform "Pant and Shirt" or "salwar Suit" with mandatory apron. NFIR, therefore, requests the Railway Board to consider the above proposal and issue instructions to the Zonal Railways accordingly, duly endorsing copy to the Federation.